LONDON - Stocks rose on Monday as Asian markets got their first chance to react to China's surprise interest rate cut late Friday and thanks to an improvement in business confidence in Germany. 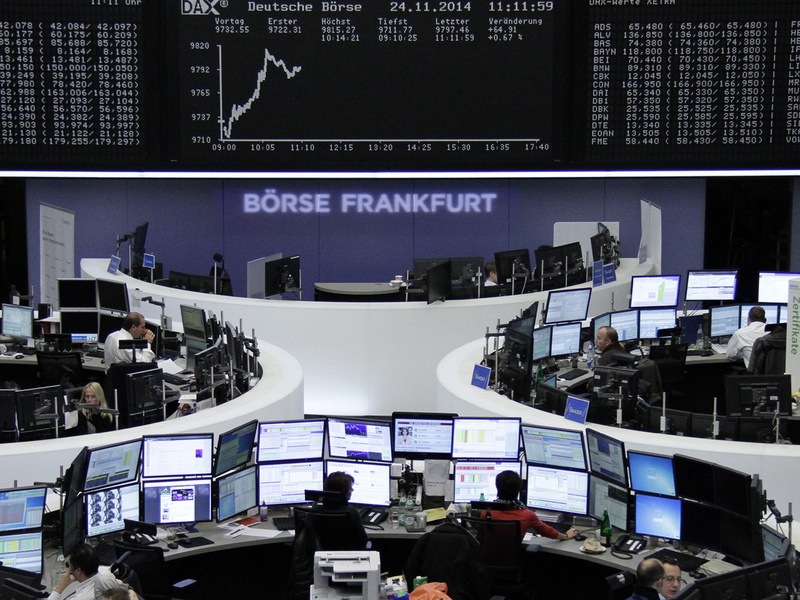 Germany's DAX rose 0.7 percent to 9,804.31 while France's CAC-40 gained 0.9 percent to 4,385.75. London's FTSE 100 dipped 0.1 percent to 6,747.57. Wall Street looked set for gains, with futures for both the Dow Jones industrial average and the broader Standard & Poor's 500 up 0.2 percent in pre-market electronic trading. China's Shanghai Composite Index jumped 1.9 percent to 2,532.88 and Hong Kong's Hang Seng rose by the same percent to 23,893.14. Tokyo was closed for a holiday. Seoul's Kospi added 0.7 percent to 1,978.54. India's Sensex rose 0.5 percent to 28,487.68 and Sydney rose 1 percent. Beijing's surprise rate cut Friday, its first in more than two years, was seen as a sign of increasing official concern after economic growth tumbled to a five-year low of 7.3 percent in the latest quarter. The central bank's move would cut financing costs for borrowers and could help to boost business sentiment and willingness to invest. Beijing has tried to avoid an across-the-board stimulus, using targeted measures to shore up individual industries instead, but analysts say the rate cut is an acknowledgement that isn't working well enough. They expect at least one more rate cut and possibly other steps to shore up flagging growth. "Although central bank stimulus is helpful, it's shooting into the headwind of oversupplied markets and, in the case of Europe, ongoing structural problems," Ric Spooner of CMC Markets said in a report. "Rate cuts in China are likely to boost activity over the longer term, especially if these initial cuts turn out to the first in a series. However, at this stage, cheaper borrowing rates will need to overcome the natural caution that flows through an economy when the property market is oversupplied and housing prices are falling." Sentiment was supported in European markets by a rise in the Ifo business confidence survey, the first after six months of declines. The increase suggests Europe's largest economy is improving after a weak summer, but growth is likely to remain subdued -- like in most of Europe. Looking ahead, investors await Friday's release of eurozone inflation figures for November. European Central Bank President Mario Draghi caused a stir when he said Friday the bank is willing to "step up the pressure" to help the economy if current efforts do not achieve the desired effect. Traders took that as a sign the central bank for the 17 eurozone countries might soon start buying government bonds. Traders are also watching a meeting Thursday of the Organization of Petroleum Exporting Countries for a possible agreement to cut production to shore up prices. The price of crude has tumbled by 25 percent over the past year as producers kept output stable while demand in Europe and other markets weakened. Lower output might help to push up prices, which would mean bigger revenues for producers but raise the risk of a drag on growth in fragile importing economies. Iran's government-run Mehr news agency said its envoys will press at the meeting in Vienna for an agreement to stabilize prices. Benchmark U.S. crude fell 29 cents to $76.22 per barrel in electronic trading on the New York Mercantile Exchange. The contract gained 66 cents on Friday to close at $76.51. The dollar rose to 118.21 yen from Friday's 117.79 yen. The euro rose to $1.2408 from $1.2360.